The Studio Albums Vinyl Collection 1971-2016 limited edition box set! "The great news is that these reissues finally have the originals' dynamic slam and punch (and some beat the originals). If you've suffered with the last and limp, squashed remastering of Exile...., you'll be in drunken/drugged out heaven with the Stones when they recorded this sloppy, debauched masterpiece as tax exiles in a Nelcote France Chateau." Music = 10/11; Sound = 9/11 - Michael Fremer, AnalogPlanet.com. To read Fremer's full review, click here. In 1969, the Rolling Stones may have famously said you can't always get what you want — but if what you want is every studio album they released after that proclamation, this is your opportunity! The band has announced a mammoth new limited-edition box set, The Studio Albums Vinyl Collection 1971-2016, due on June 15, 2018. The collection comprises all 15 albums the Stones have released since 1971 — remastered and cut across 20 LPs at half speed at Abbey Road Studios — beginning with their triple-platinum No. 1 record Sticky Fingers, which has already seen an expanded reissue, to their 2016 Grammy-winning Blue & Lonesome, the Stones' tribute to classic blues and their most recent studio offering. Each album will include reproductions of their original art and packaging, featuring the cover cutouts of Some Girls, Sticky Fingers' Andy Warhol design and Exile on Main St.'s 12 insert postcards. The set comes with download codes for high-quality digital album versions, as well as a numbered certificate of authentication. The Rolling Stones entered their imperial phase in 1971 with Sticky Fingers. What followed is a run of albums that couldn't have happened at any other time, by any other band: the decadent excess of Exile On Main St, the Jamaican voodoo swamp of Goats Head Soup, the disco and punk-infused prowl of Some Girls. With each new decade, the Stones evolved while staying true to their roots, coming full circle in 2016 with Blue & Lonesome, a love letter to their first inspiration: the blues. 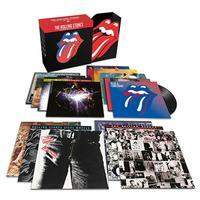 The Studio Albums Vinyl Collection 1971-2016 presents this monumental era in rock'n'roll history in a highly bespoke, lenticular mounted, limited edition box-set housing the 15 studio albums from Sticky Fingers through to Blue & Lonesome in faithful and intricate original packaging replications. Special care has been taken to create packaging to the same high standards, with detailed artwork reproduction for each album including Some Girls, which comes housed in the replica design including 20 cut-outs on the cover, while the sleeve of Sticky Fingers is presented as Andy Warhol's original design, complete with a working zip with a hidden image underneath and Exile On Main Street comes with a set of 12 original postcard inserts.